If you’re in the market for a cable management system, one that is strong, made with welded steel wire, look no further than Cablofil. www.TWAcomm.com has the right one for you. Take the Cablofil EZ Trays for example. Do you need a smaller one? How about a 1.5” deep by 10.0’ long Cablofil EZ Tray with wire grid? Maybe a bigger one? How about a 4” deep and 10’ long Cablofil EZ Tray? www.TWAcomm.com has them in stock at a price that you can afford. Maybe your needs are more along the lines of a 2” deep, 6’ 6” long wire grid that has no sharp edges to injure you. Welded wire Safe-T-Edge can carry most load requirements with ease. The package contains 6 trays 6, 6” long as well as 12 Pre-click splices with simple and easy to follow instructions. If you’re looking for an electro-zinc finish and locking tabs, how about the Cablofil FCF 54? Maybe what you need is something that’s fast to install, fits tightly, can be mounted to any surface (including ceilings, walls, joists, under conveyors and even under other trays) you should look at the Cablofil Cable G Tray 50/100. It even comes with special washers and bolts, a curved top and it’s two inches deep and four inches wide! Maybe you’re looking for threaded rods? Cablofil has them! The Cablofil ½ " Threaded Rod comes in a ten pack. They measure ½ "x12"x72" and are perfect for trapeze mounting. 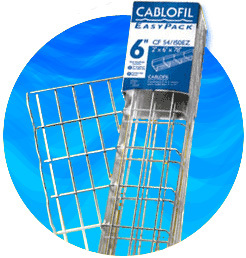 The Cablofil CF105 4” Deep Hot Dipped Galvanized Tray might be just what you’re looking for. The wire mesh is smooth and rounded so you don’t wind up with a dust or dirt build-up. It has easy to handle straight sections, 10’ long. The 2”x 4” wire grids are easy to maneuver. With the special 4” high flange side tray, you know it won’t fall off. The Safe-T-Edge has no sharp edges and can’t scratch or cut your installers. Just go to www.TWAcomm.com and look at the inventory they have! No matter what you need in the line of Cablofil, you can find it at the price you’ll be happy with. The selection is great and the products are all of the best quality.